What Can I Do on a Spring Visit to Alaska? 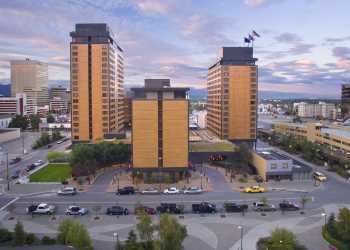 Spring is an exciting time in Anchorage, Alaska, and a great time to visit. Whales and other marine wildlife species return to the coast. Moose calves are born and bears come out of their dens. Of course - unlike bears - a few of Alaska best activities never hibernate and are available year-round. By the end of February, Anchorage is gaining an extra 42 minutes of daylight each week. After March 20, Anchorage has more hours of daylight than anywhere in the other 49 states. The true midnight sun is still a few months off, but that means northern lights viewing is still feasible in the evenings through April. Temperatures rise, but there’s still plenty of picturesque snow on the mountain tops. Alpenglow colors the snowy peaks with ethereal shades of orange, pink and red as the sun set on spring evenings. Alyeska Resort holds Spring Carnival and Slush Cup in early April. It’s a wet and wild farewell to skiing and a warm welcome to spring. By early May, the sun won&apos;t even dip below the horizon until nearly 11 p.m.
Gray whales are the first migratory whale species to return in the spring, and whale watching cruises depart Seward run mid-March to mid-May. Major Marine Tours and Kenai Fjords Tours each offer four hour tours departing Seward at noon. Blackstone Bay glacier cruises from Whittier aboard Lazy Otter are another spring option, with multiple departures daily available running from March through the summer. Moose make their home in Anchorage, and you&apos;ll be arriving just before this season&apos;s calves do. Keep a sharp eye out and you may see one just traveling around town. If you&apos;d like a closer look at a moose (plus dozens of other species) the Alaska Wildlife Conservation Center in Portage is worth checking out. Musk ox, caribou, wood bison and many more species in a large nature preserve. Their brown bears will be more active as May approaches too. Sightseeing flights are popular and available no matter the season. Flights with many companies use Lake Hood, Merrill Field, or the helipad in nearby Girdwood. It&apos;s a great way to get a special perspective on the landscape. You can even book flights that circle Denali or land on one some of the glaciers near Anchorage. The Anchorage Museum merits a stop no matter the season. They&apos;re open six days a week (closed Monday) all winter, and switch to seven days a week on the first of May. The museum is home to a stunning Alaska Native art collection, Alaska history as well as rotating exhibits about life in the north, Alaska art and cultures. Alaska students compete in games practiced for millennia. The NYO Games test endurance, agility, strength and speed in events drawn from traditional Alaska Native life. The competition is open to Alaska students from across the state, and admission for spectators is free.